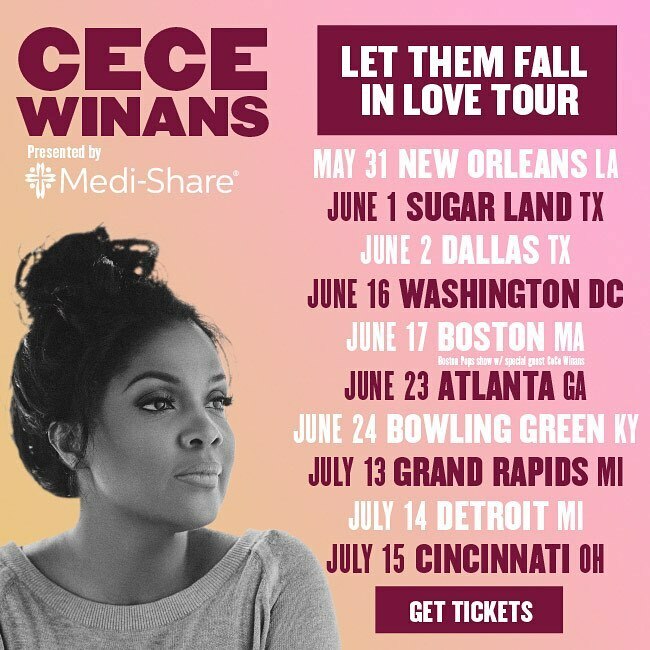 CeCe Winans has been on tour for her new album “Let Them fall In Love” The Fall In Love Tour kicked off on May 31 in New Orleans with stops in Dallas, Washington DC, Atlanta, and Detroit with the tour concluding on July 15 in Cincinnati, OH. Tour Details on the flier above. Her current release titled Let Them Fall In Love (Puresprings Gospel/Thirty Tigers) was both critically and consumer acclaimed. Her first project in nearly a decade, the album debuted atop the Billboard Top Gospel Chart. In addition to heavy airplay across Urban Adult Contemporary, AAA, and Non Comm radio stations, the project’s lead single “Never Have To Be Alone,” was among top 5 on Billboard’s Gospel Airplay Chart.